From Meredith to Mommy: Is It REALLY Worth Arguing About? 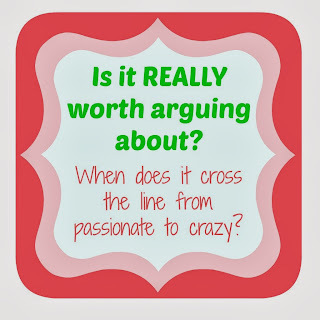 Is It REALLY Worth Arguing About? I'm not someone who thrives on arguing. I would have been truly horrible at debate. Don't get me wrong. I have opinions. I do share them. When you ask me, I'll tell you what I think. Maybe you'll agree with me. Maybe you won't. But you probably won't get me all riled up. In fact, even if you do get me riled up, there's a good chance that I still won't take the bait. I'll walk away. I'll vent like crazy later, but I'm not someone who loves a good argument. Not in person, not online, not even when baited. By the way, this occasionally drives Adam crazy. He does like to argue. Because I don't take bait, he often ends up arguing with the TV. Everybody wins! And judging by social media lately, I'm alone in this. I can see being passionate about certain things and needing to get your opinion heard. Politics. Morals. People have their hot button topics. The other day I was scrolling through my feed, and one of the pages I follow - I don't remember which, maybe Parents, maybe PopSugar Moms, maybe Gerber, some page like that. One that asks a question and then fans of the page submit comments. The question was something like "do you call your child by a nickname or their full name?" Or not. People went crazy in the comments, fighting over this. Getting nasty about it. Posting back and forth getting increasingly mean and ugly about those who preferred the alternative. Let me tell you, if these people are actually as crazy as they seem, I really, really hope I never run into them and need to address their children. Because...wow. Now to be fair, there were plenty of non crazy people who commented, as well as those who admonished those who were getting so fired up. Now my preference is pretty clear. We call both kids by their full names. Reagan doesn't have an easily nickname-able name, but Madison does. In fact, she has occasionally been called Maddy (or Maddie, or Madi, or Mady, or any of the others). She's never been called Maddy at home, but sometimes it happens by people who don't know us well. Politely. If someone asks, we tell them she goes by Madison. If someone (the receptionist at the dentist, the person in the pew in front of us at church, for example) doesn't ask, and simply refers to her as Maddy when they see her name on a list or name tag, we usually ignore it, or find a way to address her as "Madison" in front of them. When we registered her for preschool, we got the option to indicate a nickname, which we left blank. There is another Madison in her class, who goes by Madi. Madison's coat hook and papers say Madison, Madi's say Madi. If her teacher had met her at the door with a Madi name tag or constantly referred to her as Madi, then yes, we'd correct them. But politely. No one got all worked up, no one went crazy, no one told us we were making a bad choice and were saddling our child for life with that name. Maybe they talked about it among themselves, but certainly no one mentioned it to us. Why? Well, because she's our kid and it was our call. And we have (mostly) normal family and friends. But probably most importantly because it's not worth the argument. What is the point of getting so fired up over what someone else chooses to call their child? Some people go by nicknames. Some don't. Some people are called by their middle names. Some people gave their child a name that others may see as a nickname only. I think (well, I hope) that whichever social media manager who posted this question just thought it might be fun for people to chat and to see if there's a trend. I can't imagine that they expected people to start a thread with hundreds, thousands of comments where they attack those who...use nicknames? I can't even type that without shaking my head at the ridiculousness of it all. Breast or bottle, co sleep or sleep train, work or stay home, vaccinate or no, public school or homeschool, the list of divisive parenting topics is broad. I go by the "your kid, your call" method of live and let live, but I guess I do understand why people can get so fired up about some of these topics. To be clear, I don't get all fired up. Unless you are actually abusing your child, it's your choice to make, even if I wouldn't make the same one. 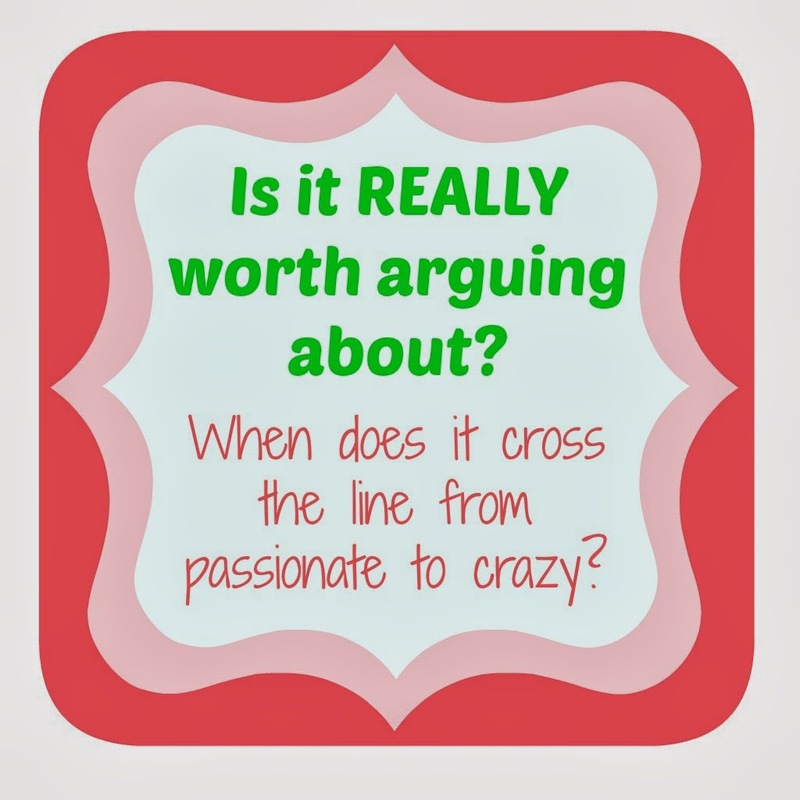 When is something worth having a debate? What gets you fired up? Have you ever been sucked into an online argument or do you (like me) just read them, shaking your head?